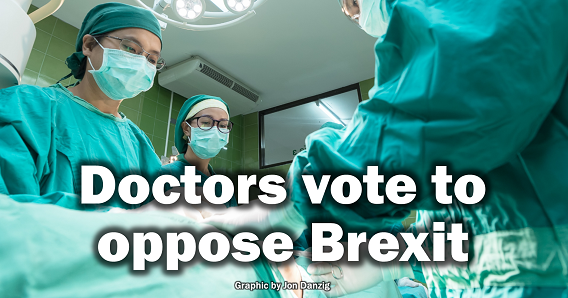 Doctors have voted overwhelmingly to ‘oppose Brexit as a whole’ following a vote at the AGM of the British Medical Association, the trade union and professional association for doctors and medical students in the UK. The medics said that leaving the EU is ‘bad for Britain’s health’ and endorsed a new public vote on the final Brexit deal. The motion called on the BMA to ‘publicly announce that it is concerned that Brexit poses a major threat to the NHS and the nation’s health’, while supporting ‘open border arrangements with free movement of healthcare and medical research staff’. Until now the BMA has adopted a neutral stance on Brexit. But after the AGM debate, some 76% of representatives voted to remain in the single market, and 91% supported free movement of healthcare workers and research staff. Following the vote, it will be BMA policy to ‘support the idea of the public having a final say on the Brexit deal, now that more is known regarding the potential impact of Brexit’. The Royal College of Nursing and the Royal College of Midwives have already backed calls for the public to have a final say on Brexit. “The fact is that the government is woefully underprepared to ensure the United Kingdom’s health and wellbeing is secure in time for the self-imposed deadline of 29 March 2019. Brexit is bad for Britain’s health. Reasons2Remain has been running a poster campaign asserting that ‘informed consent’ was never given for Brexit, as the electorate was misinformed. Dr David Strain said that 20% of NHS research and development funding came from European drug companies and a further 23% from European small enterprises. “If we lose our parity with the European Clinical Trials Directive that money may disappear,” he said. Dr Chandra Kanneganti, who sits on the BMA GP Committee, added, “We oppose what’s happening and we want a good deal to be part of the European Union because we appreciate the enormous contribution of the European healthcare workforce, who work in the NHS everyday. Dr Paul Williams, a GP and the Labour MP for Stockton South, told the Guardian that support for the motion was “a sign of the growing momentum behind the people’s vote campaign”. He said nobody voting in the EU referendum wanted to harm the NHS but that Brexit was already causing severe problems in staff recruitment and retention. “Instead of the £350m a week for the NHS we were promised by the Brexiters, we have had cuts and closures as the NHS loses staff and struggles with budgets that are limited by the Brexit economic squeeze. “The BMA’s decision to back a final say on the deal demonstrates the extent to which Brexit threatens our health service. “With EU nurses and doctors leaving the UK, and an alarming 87% drop in the number of nurses and midwives joining the register from the EU, we are already witnessing the disastrous impact of Brexit on our overstretched health workforce. Today on the Andrew Marr Show, the head of NHS England, Simon Stevens, said that the NHS was preparing contingency plans in the event of the UK leaving the EU without any deal. Concerns have been raised that if Britain leaves the EU without a deal, disruption to imports of drugs and medical equipment could cause widespread hardship to patients. Almost three-quarters of Britain's entire drug imports come from the EU. One senior NHS executive, who did not want to be named, warned me that patients could die as a result of a no-deal Brexit, because Britain would find it so much harder to import essential drugs. Another major worry has been the retention of international staff amid evidence already of a Brexit “brain drain” of health workers who come from the EU27 countries. Many thousands of EU staff have already left the NHS as a result of the Brexit vote, and many thousands more have indicated that they will leave. Brexit was cited as the main reason why almost 4,000 EU-trained nurses and midwives left the NHS in 2017, according to a survey by the Nursing and Midwifery Council. There's no doubt that Brexit is bad for our health. The question is: why are we doing it? I still cannot find even one valid or validated reason or benefit.